So I spent the evening peering over people’s shoulders at a runway and drinking delicious organic cocktails in a multistory carpark at Undress Brisbane‘s 2013 Runway event, a sustainable fashion show. So many shoulders. Such little view. Now I know why women wear heels to fashion events. So I’ve been to Rumpus Room a fair few times over the years. The most memorable was definitely a 29th Birthday party where we had hired a party bus and frantically drove all over Brisbane to some of the best and worst bars whilst playing party games. At Rumpus Room, the game was simple: if someone put their head on the floor, everyone else had too as well. The last person to put their head on the floor had to drink a shot. It was a complex game. This time as the Rumpus Room was much more tame but still lots of fun- we arrived during happy hour (5 until 7) and had many $5 wines and beers and a few $10 cocktails. My sister-in-law and I checked out every guy in the bar (sorry if you were subjected to our oggling) and debated who looked like a decent person for my sister-in-law. I thought there were some interesting looking guys but she wasn’t impressed. I once came here with a friend who was them chatted up by three guys in 20 minutes! Maybe my S-I-Law needed to be there a little later. Rumpus Room is open later than most West End bars (most close at about midnight) and has a good mix of people- diverse ages, subcultures and styles. I miss the giant bean bags. Those things were FUN (but probably grotty). So there’s something about the name of the Hoo Ha Bar that is just funny. Or I’m just really immature. I must be the last foodie/alcoholic in Brisbane to discover this place and was truly disgusted in myself when the bar staff told me Hoo Ha had been open since March. It’s less than six blocks from my house (on Tribune Street near the bus and train stations) and I didn’t know it was there. Food blog fail. I found out about it yesterday and was there last night. There’s not much room in Southbank for bars that aren’t “in” Southbank and therefore expensive and potentially revolting so I was excited. I told Ben we were celebrating his new job. But he knows. 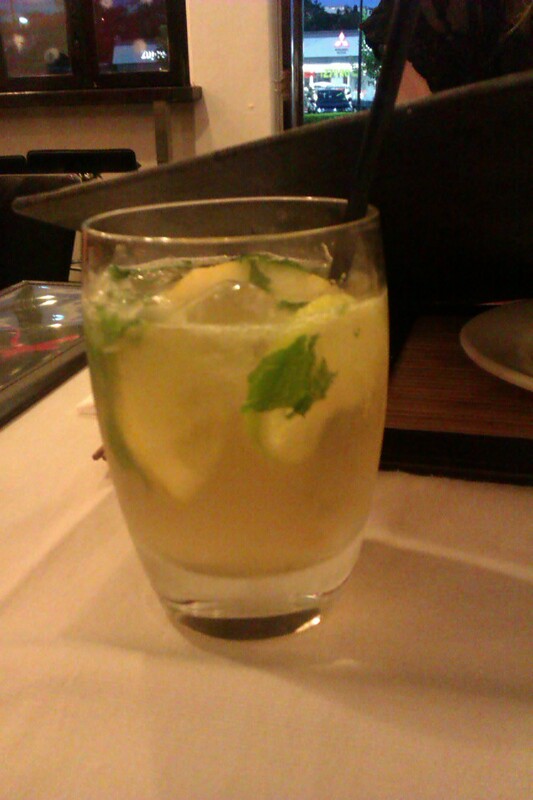 We moseyed down about 6.30 and although it was after happy hour, we had a happy time. We perused the beer and cocktails menu and Ben got a Coopers something (beer, pffft) and I was torn between a Bison Shake and a Cuban Espresso. As much as I wanted a Cuban Espresso and my general judgement of a bar’s cocktails rests on the mixing of coffee and alcohol, I didn’t want to be up at 11 pm with foil on my head paranoid about alien invasions. I likes me sleep. So I went with the Bison Shake (Vodka, Peach schnapps, cloudy apple juice, passionfruit and grapefruit bitters) and was not disappointed. I could have drunk these all night, but at $16 (standard full priced cocktails in Brisbane), I couldn’t afford to last night on our budget. I am happy with the knowledge that many of these drinks are in my future. We also wanted a nibble and Hoo Ha serves sharing plates in the evening. I think this is a great idea, not just because I don’t like drinking on an empty stomach, but because it’s a great way to offer food without worrying about chefs and the full dining experience for now. They do however offer a breakfast and lunch that looks divine (check out their Facebook page on the link at the top), but that can be a post for another day. There was a meats board (errr, not for us thanks), a cheese board (3 cheeses for $20!!!) 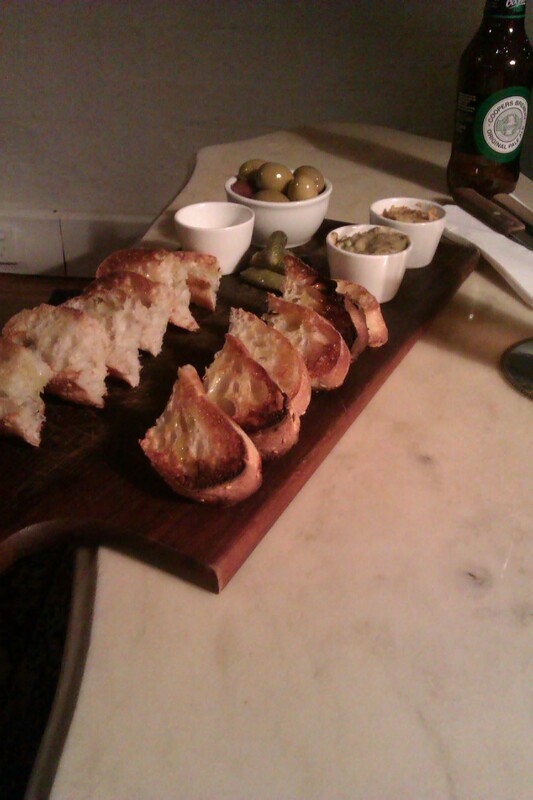 and a bread and dips board for $10. We decided on the dips, which were hummus and babaganouj with warm olives, pickles and Turkish bread. It was a great appetiser for two people (we were going on to eat dinner elsewhere) and we both enjoyed it. I don’t normally like babaganouj but this was nice and simple. We sat in seats from an old church- upright individual seats with room to kneel facing them. They were surprisingly comfy and made for lots of good elbow leaning. 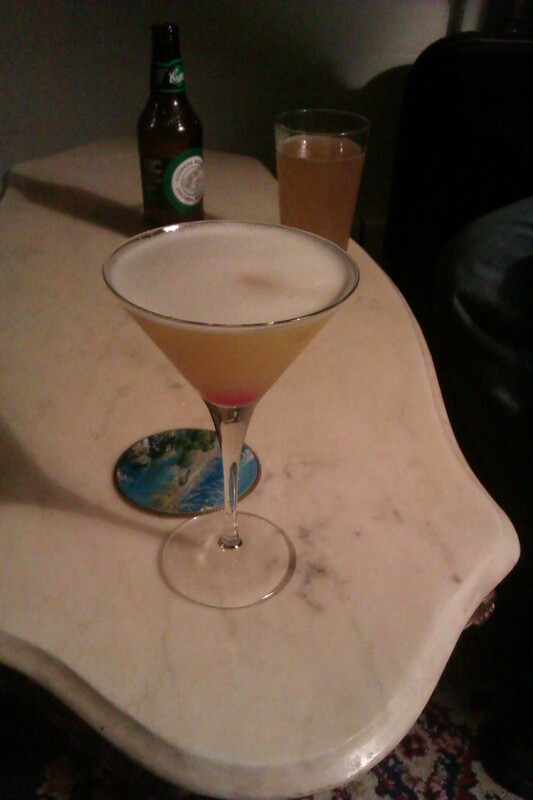 All I needed was a glass or port to swirl. 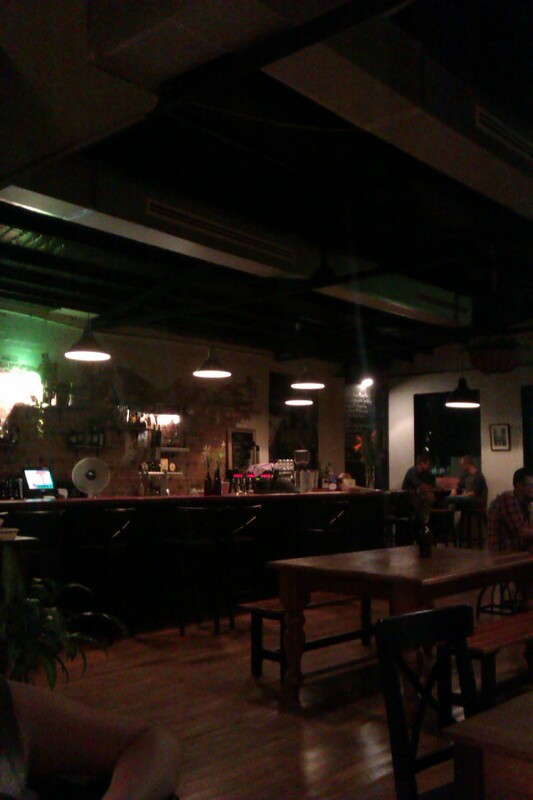 The rest of the decor is like a great living room (perhaps from a Teneriffe warehouse apartment? 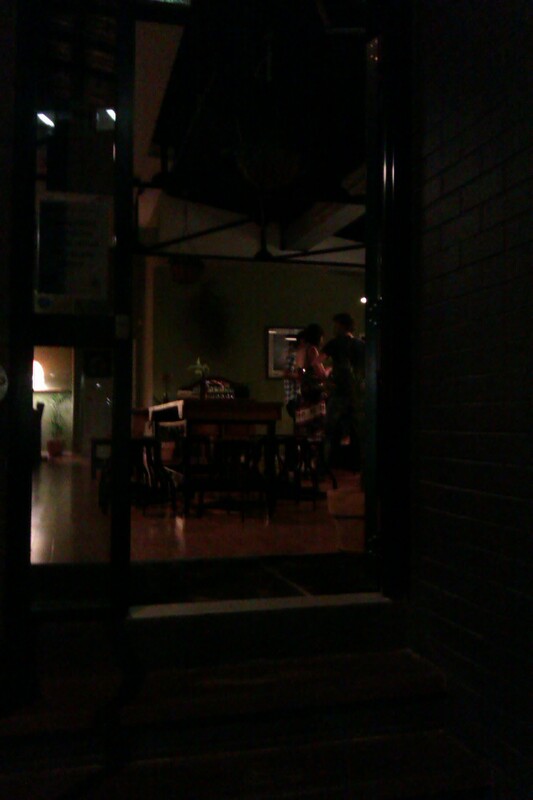 ): brown leather couches and big wooden tables with dining chairs. I liked the set up because rather than uncomfortable places to perch, the feeling was “Come in and SIT and FACE your friends and RELAX”. A mix of REM and Radiohead was on the speaker system but you could hear your neighbour with ease. 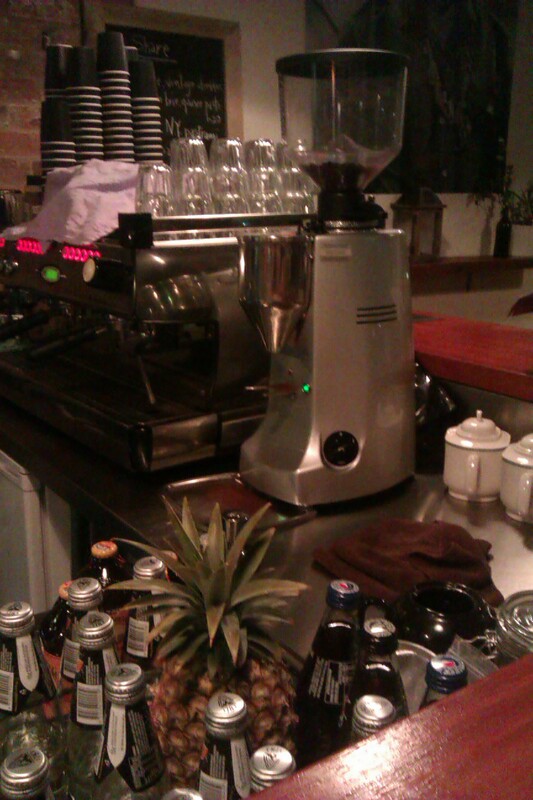 The two guys behind the bar were relaxed and friendly and didn’t seem intimidated by my intense cocktail-making watching, which I do without realising it and am sorry. It was a quiet night, but the photo makes it look quieter. More people were sitting around the edges of the room. Ben’s comment really sums up the vibe: “I feel like this is a place where people come to enjoy themselves and have a chat and laugh without being obnoxious dicks”. I hope so! Now that Pear Cafe and Bar is not open as much in the evenings, I see Ben and I having many a sit, sip and sup here over summer. So last weekend I helped to host a group of interstate colleagues on a bar browse while they were at a conference. Sling cocktail bar for the hell of it. Admittedly, not as many places as our practice run, which left me deciding to do the actual one drink free, but it was still a very good night all round. Lots of little nibbles for vegos and their friends at Era. 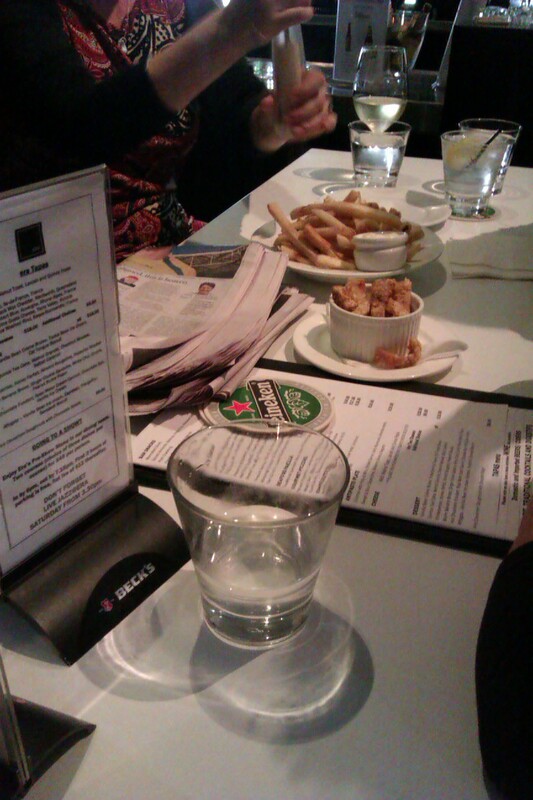 Unfortunately for this photo, that dish in the foreground is pork crackling, but the chips and aioli pleased the crowd. 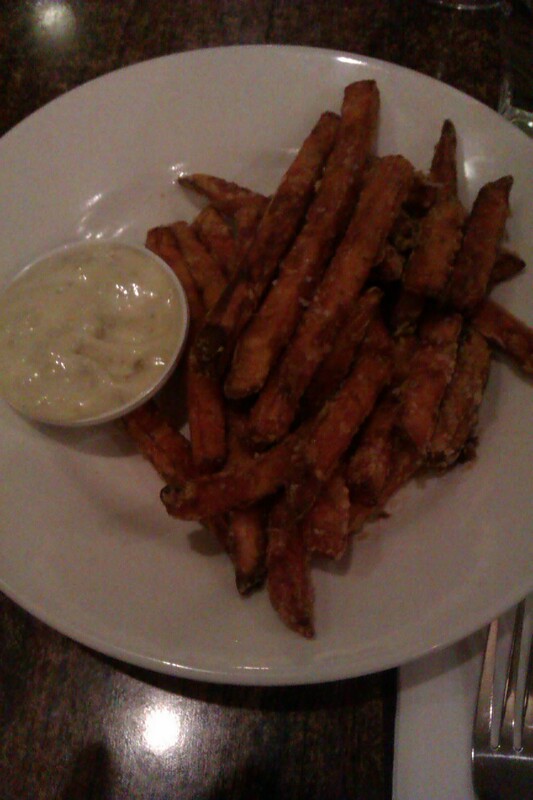 Sweet Potato Chips with Blue Cheese Aioli and Lock and Load. $8.50. Can we say YUM?! And Lock and Load handled an unscheduled group of 14 with no sweat. Very cool, guys! I’ll be doing a full review of Lock and Load in the next couple of weeks (just gotta go back and eat a bit more of their food, gosh-darn-it!). Recently I was asked to find a restaurant in the Mr Gravatt area to have a catch up dinner with a couple of friends. Not knowing the area very well, I did a lot of urbanspoon hunting and found Koncept. Eating out in smaller, local areas that aren’t foody-centric can be tough, as some places that cater to a large amount of people can get lazy (that Thai place near you, you know the one I’m talking about. But not mine, my local Thai place is YUM). There was just enough competition around to suggest that Koncept needed to stay on its toes. I had made a booking, and we were seated quickly, although were still waiting for the last of our party to arrive. It was a quiet, mid-week night, but there were still about 3 other groups of people there- all Japanese or Asian. I admit, I am one of these people who gets a good first impression of an international restaurant positively if I see people from that country enjoying the food! Later, an anglo family joined us all. We perused the menu until our friend arrived. Veggie options included dumpling, tempura and sushi. It wasn’t an exhaustive list, but was rather nice. The prices and sizes were small- think tapas bar, where you really need to buy two-three things to fill up. After the last person arrived, we ordered. I wanted to try the vege dumplings, as I was avoiding fried food, but they were out. 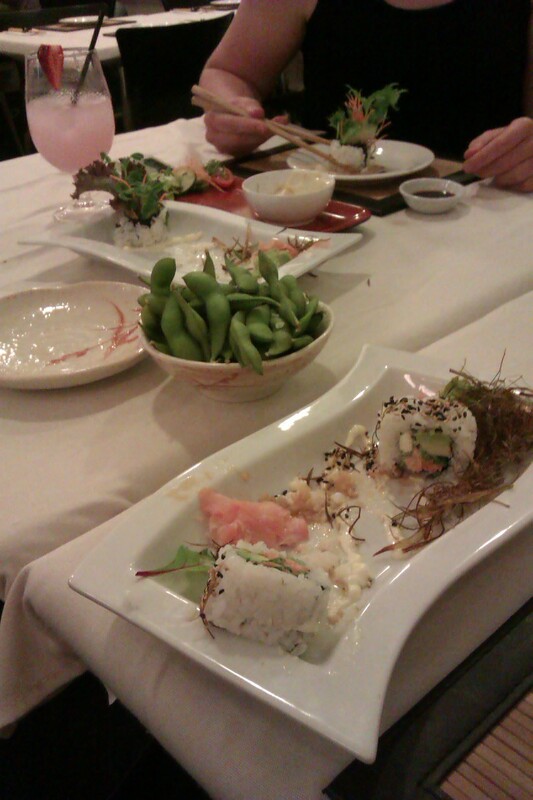 I had veggie sushi, agedashi tofu and ordered edamame for the table. My friends ordered sushi and one ordered something fishy. Literally, but I just can’t remember what. The timing of our food was a little slow and erratic. Things we thought would come out together came out last, or we had to ask for it. The wait staff were consistently pleasant and attentive. When the food did arrive, we weren’t disappointed. Everything was beautifully presented and very fresh. 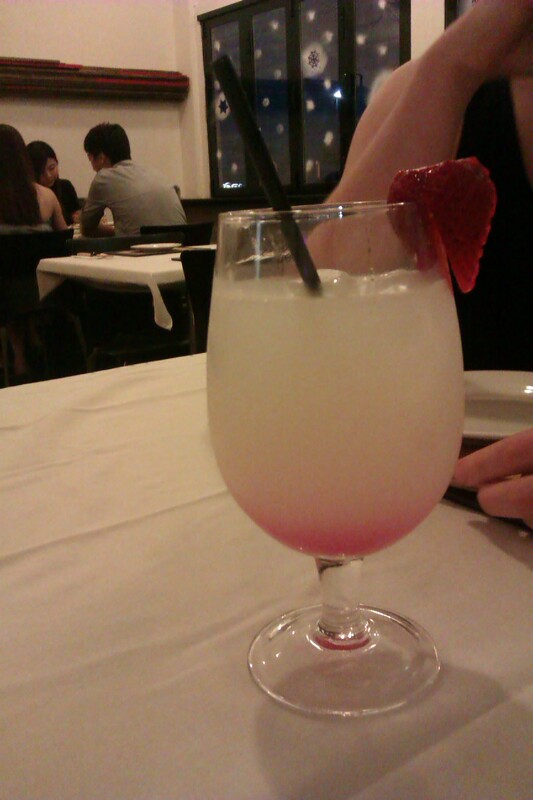 The presentation was very western styled, which was some of the fusion of the restaurant, I suppose. 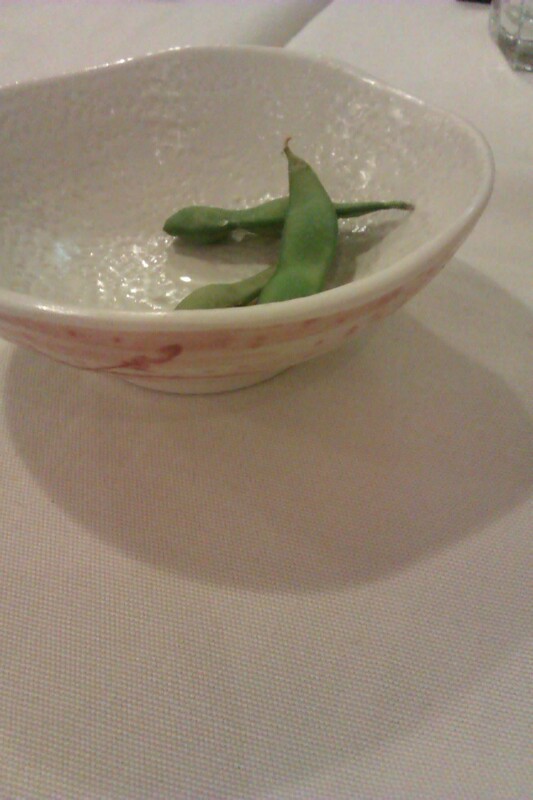 The edamame were delicious and salted a perfect amount. 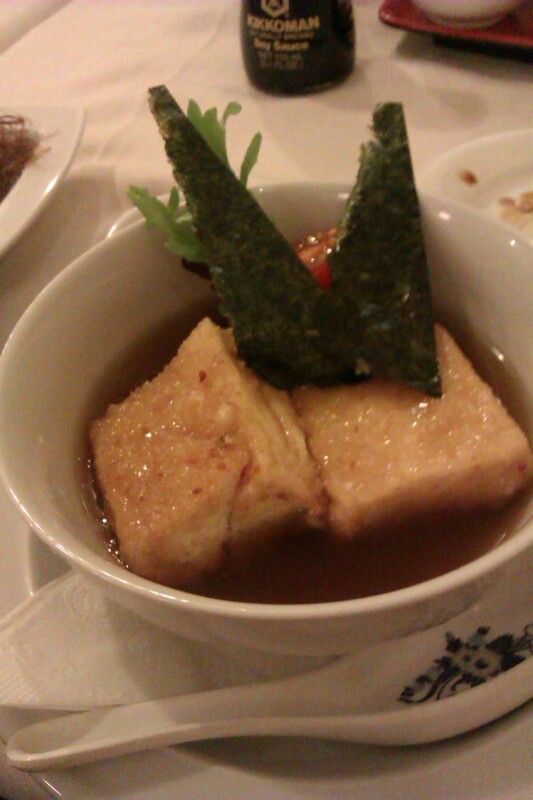 I normally am not a huge agedashi tofu fan (pictured) but this was good. 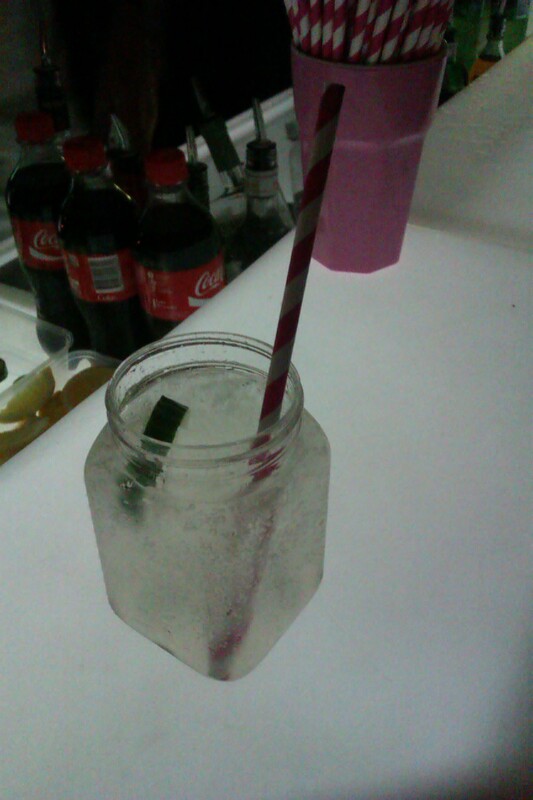 The thing to write home about here are the DRINKS! The DRINKS, children! 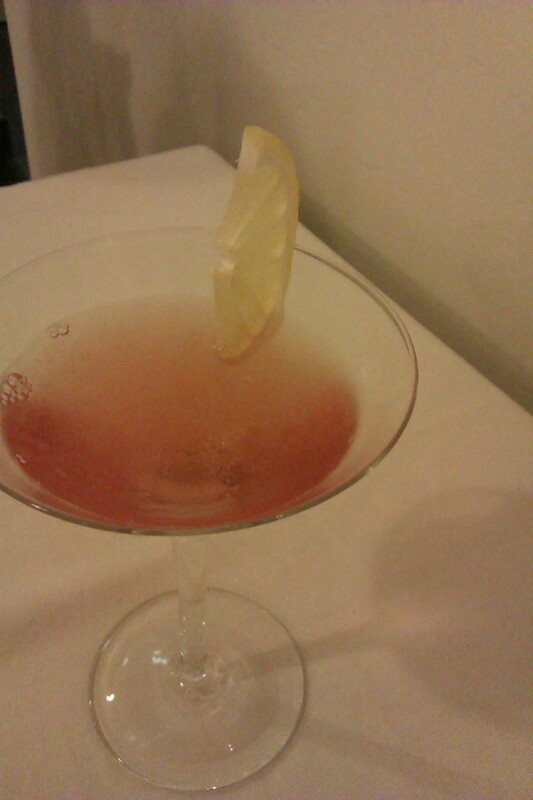 Fully licensed, Koncept has cocktails based on traditional spirits, as well as saki and umeshu (plum wine. Well, technically not plums, but close). I had to drive, so couldn’t immediately jump into all the delights on the menu, but bevvies started from $5 to the more typical $15 for cocktails. Lots and lots on the drinks menu were $7-8 dollars. On the drinks specials menu, they were $11-12, but also a bit fancier. What you see here is a mojito, a pink mess (not its name, just can’t remember what was ordered) and a cosmo made on plum wine. Everything I ordered came to just over $20. For a drink, sushi, agedashi tofu and a share of edamame, I’m impressed. If the food timing can be sorted out a bit, this would be a fantastic place for a light, yet satisfying meal (with drinks!). So as stated earlier, I went out last night with Ze Girls, which was really nice as one has just returned home from overseas and one is a new mum and hasn’t been really out and about yet. We went to Kapsali in Southbank, which was really nice considering that they had written the wrong booking time down, were crazy busy and still had us seated before anyone else who arrived at the same time. It’s not the best Greek you’ll ever eat, but it was nice. 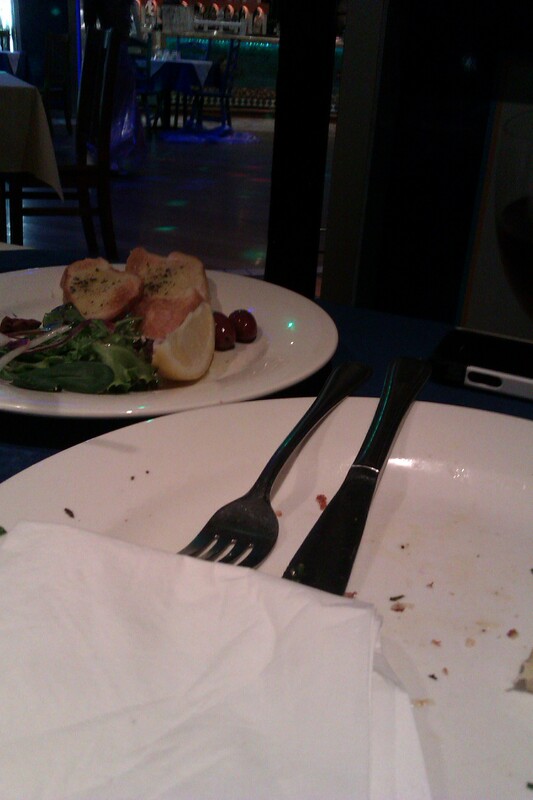 We had a variety of the menu but for us vegos, there were fewer options than most Greek places in Brisbane. I ordered Spanakopita (which was a side dish) with a side of Greek salad and a piece of haloumi. To their credit, they didn’t muck up the specialised order despite the crowd, but my Greek salad had grated carrot on top and floury tomatoes. 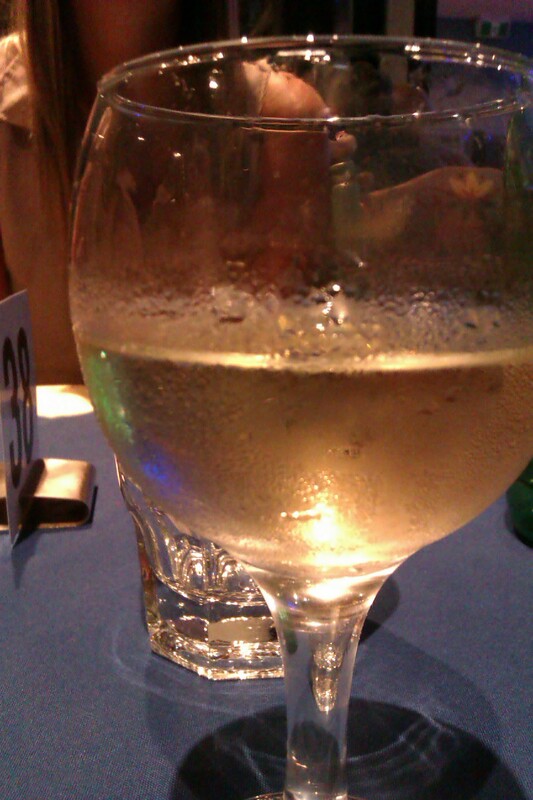 The price was good, and three of us (there were 5) ordered a very well priced bottle of wine to share. Since when you buy a bottle of wine from a restaurant for under $30?! I forgot to take photos as we ate very late and fast! There was also live music, a belly dancer (Greek…?) and some Greek dancing with diners. Was it as veg friendly as some Greek? Probably not, although it did have a pumpkin and spinach ravioli for $25 and a fried ricotta and char grilled vegetables dish for about the same. My vego friend and I were expecting a haloumi dish, or dolmades with salad. There was an antipasto platter with meat that could easily have been edited for vegos and there were lots of vege side dishes that you could piece together, like we did (my friend ordered the haloumi entree and garlic cheese pizza bread). Some of the girls had to leave, so sweet things were had at Max Brenner. 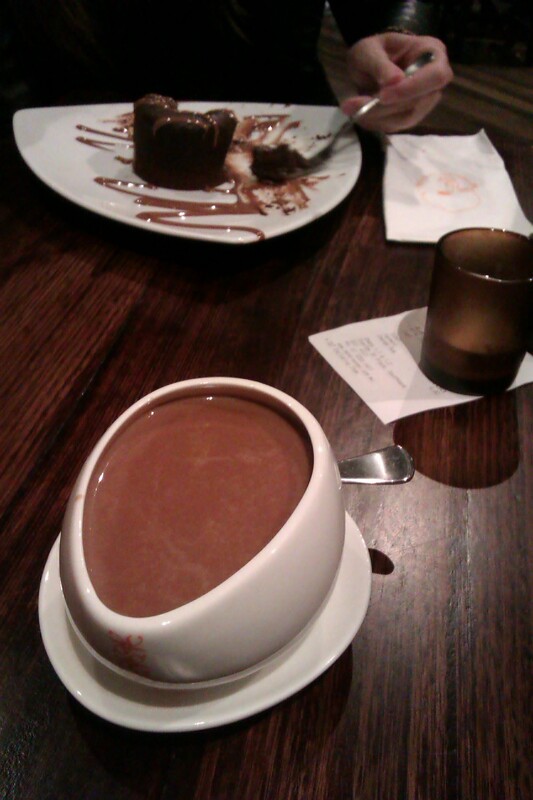 Now, I have nothing at all against Max Brenner chocolate shops… except the lines. I don’t understand why people line up that long and I wouldn’t have except that a) I had suggested it, and b) I was with friends, which makes the line ride a lot more fun than normal. So we all had sugar overload. No regrets, no excuses. The first picture of chocolatey goodness and addiction shows my mate’s chocolate souffle and my Italian hot chocolate in a hug mug. The novelty is lovely but I freak myself out thinking that everyone who’s had that mug has used the EXACT same spot from which to drink. Luckily, it’s such good hot chocolate, even over-imaginative freak outs can’t stop me from enjoying it. 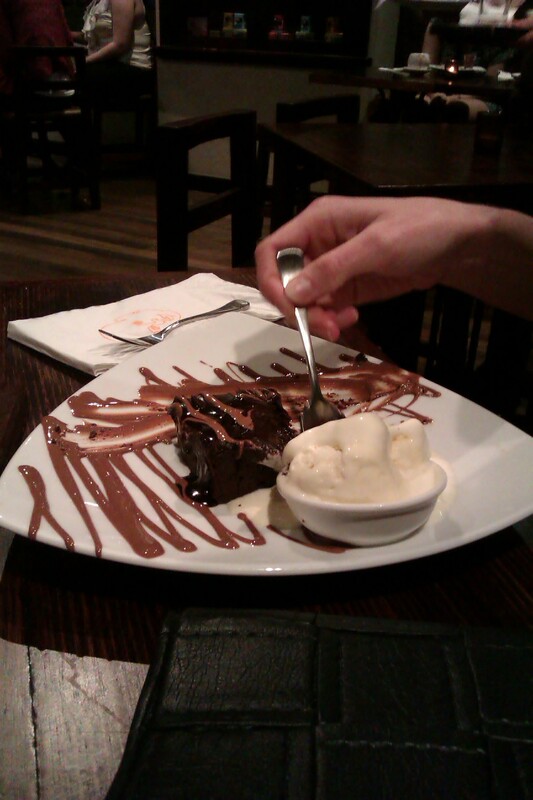 The chocolate souffle was cold, delicious, but cold, which surprised us a little. They all came out at different times, but the staff are really lovely and handle all the crowds with a smile and good professionalism that reminds me that I’m glad I only did waitressing for two years! You can also see the brownie with ice cream (ever so slightly warmed up), which I had to admit, tempted me for a while when we were standing in line (although the Sensual Chocolate Dome or whatever it was called did NOT call to me through time and space in the same way…). And then we all felt overly-full and sick, even though we didn’t think we had eaten that much at dinner. Luckily, a waddle down to West End fixed us up a bit and we had cocktails as Sling bar, which had an outdoor area out the back which I never knew was there and the BEST wait staff who a) knew their cocktails and b) all seemed to be English. And here I was thinking the Brits were all about cider and pie. 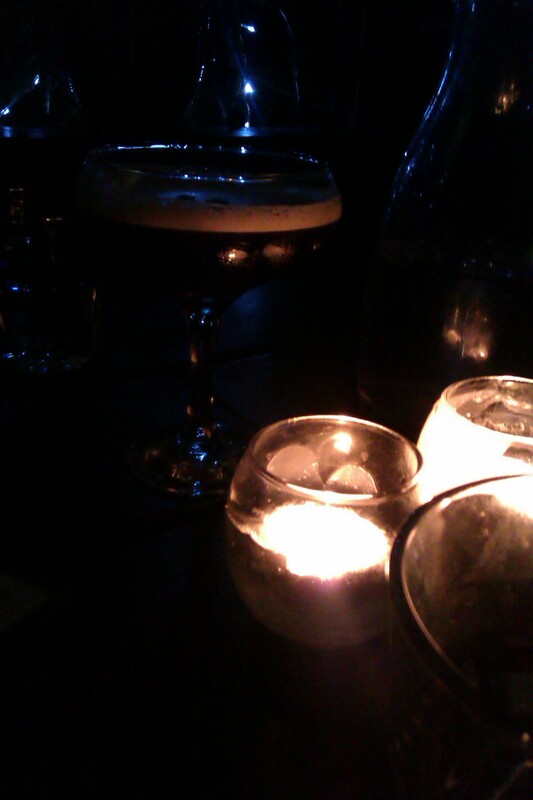 I took a photo of my espresso martini (not on the Lord of the Rings trilogy length menu but my base line for cocktail excellence) but it was just so ambient and dark, you can’t see it properly. 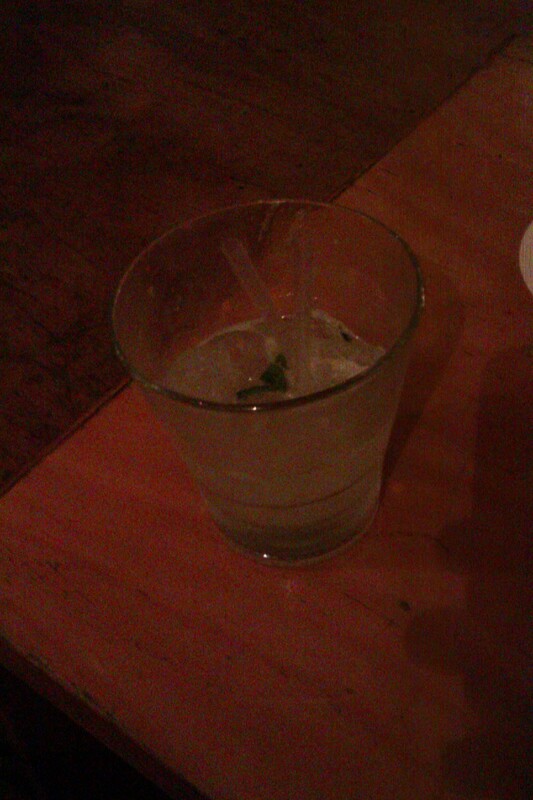 I followed it with a mojito special. One of the girls had a Polish Prince with vodka and apple juice, and the other had something the waiter made up and something I can’t remember now (you must remember, we’d had a long night by now!). One of the girls went home, and my long lost friend and I crossed the road to the Rumpus Room, where she was immediately picked up. Three times. In an hour. Geez. Excellent ego booster, but makes it hard to catch up on serious. life. stuff. Like caravans and English pubs. Finally, after toddling home, Ben was passed out on the couch, unmovable, so I got the bed all to myself. 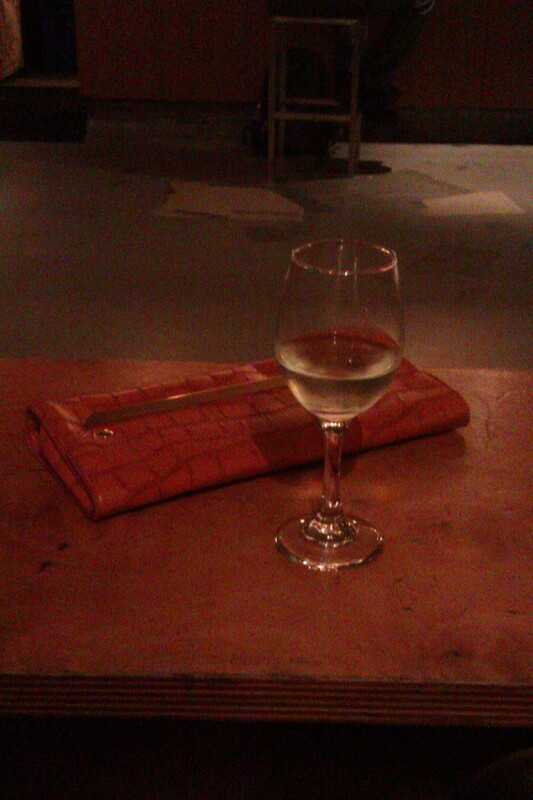 Excellent end to an excellent night.